A grand jury indicted suspected white nationalist Jeffrey Clark of Washington, D.C., on federal firearms charges. Prosecutors Friday will argue a judge should order Clark held pending trial. 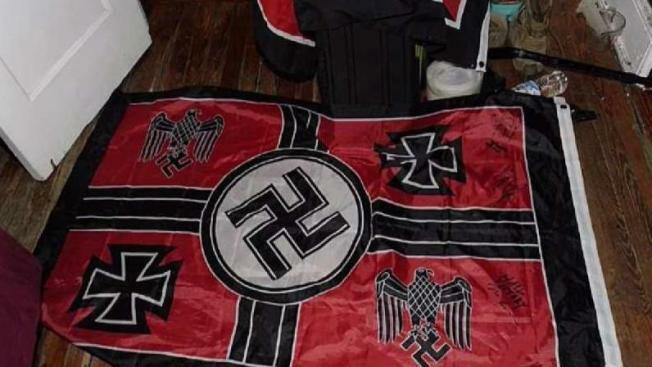 In a memo to the court, the U.S. attorney for D.C. said investigators found several items in Clark’s home after his arrest, including: Body armor, helmets, hollow-point ammunition, a Nazi flag and a drawing of an individual pointing a rifle at a male figure wearing a yarmulke. In their motion requesting Clark be ordered held in custody, prosecutors said Clark discussed the recent shooting spree at the Tree of Life Synagogue in Pittsburgh during an interview with agents. Agents asked Clark about the suspected gunman Robert Bowers. Federal prosecutors said Clark and Bowers were connected on a social media platform. Clark is scheduled to appear Friday afternoon for a detention hearing at D.C. federal court. According to court filings, federal agents investigated Clark and his brother in early November after receiving a tip the two had been heavily involved in the white nationalist movement. According to court filings, Clark’s brother committed suicide in D.C. on the same day of the Tree of Life synagogue massacre. Prosecutors included images of items seized from Clark. Clark’s relatives and defense attorney declined to comment.